Space, space for everyone. You can breathe freely. 180 sq.m. of accommodation and 1,300 sq.m. garden. Very large open-plan living room and 4 bedrooms, all with queen-size bed and private bathroom(!). You'll love this tasteful, loft-style barn conversion. Exposed beams and stone walls, designer fireplace - cosy yet stylish. And if there's a pianist in the group, you can all enjoy a 'moment musical' during the aperitif. 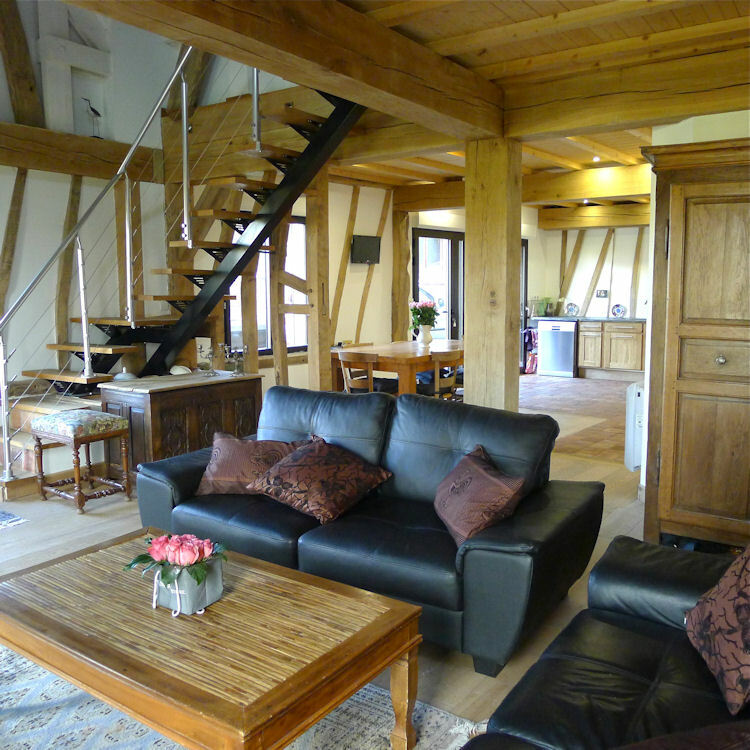 Tasteful barn conversion with bags of charm, traditional features retained. Ground floor: very large living room with open-plan fitted kitchen and lounge (TV, open hearth fireplace, piano). Utility room (tumble drier, washing machine). Closet. Separate WC. Spacious bedroom (queen-size bed) with en-suite shower room (walk-in shower). 1st floor: mezzanine (desk), bedroom (two 80x200cm beds) with en-suite bathroom (whirlpool bath), 2 bedrooms (two 80x200cm beds in each), shower room/WC.|Terrace/solarium (outdoor furniture, gas BBQ). Woodland.